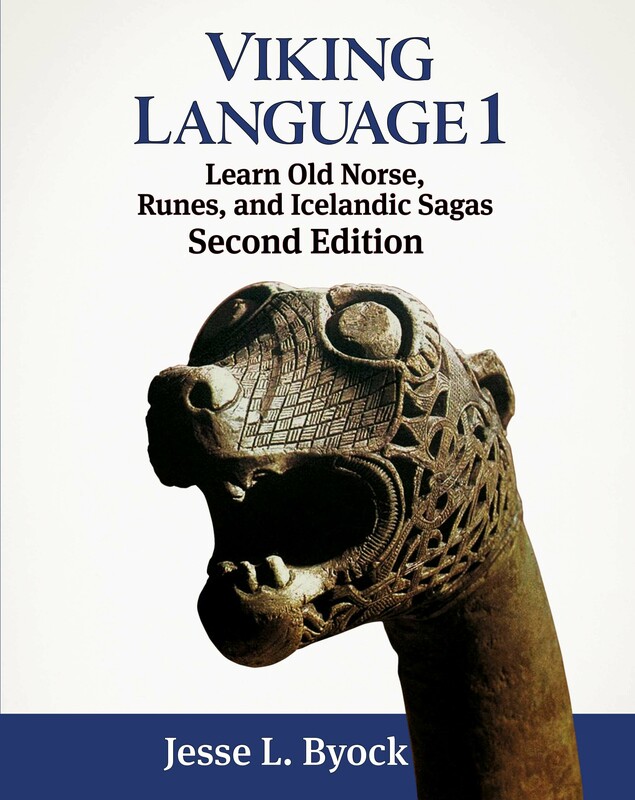 Viking Language 1, Second Edition: Learn Old Norse is an introduction to Old Norse, runes, Icelandic sagas, mythological tales, and the culture of the Vikings. The 15 graded lessons include vocabulary and grammar exercises, 35 readings, pronunciation, 15 maps, 45 illustrations, and 180 exercises (with a Free Answer Key available as PDF download). 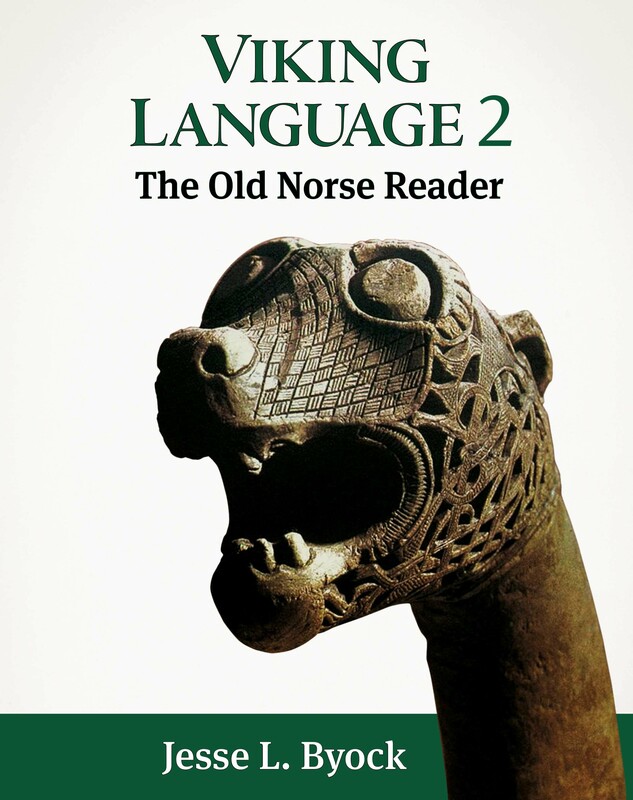 Viking Language 2: The Old Norse Reader immerses the learner in Icelandic and Viking Age sources. It provides the tools necessary to read complete sagas and Norse mythic and heroic poetry. The reader is a collection of original texts to accompany Viking Language 1, including Norse family, kings and legendary sagas, runic verse as well as eddic and skaldic poetry. The selections range from the doom of the gods at the final battle Ragnarok to descriptions of the ring and the dwarves’ gold that inspired Wagner’s Ring Cycle and J.R.R. Tolkien’s Lord of the Rings. The Old Norse Reader is a stand-alone book for classes and the self-learner, accompanied by introductions, notes, maps, and cultural discussions and includes a comprehensive Old Norse reference grammar with an extended vocabulary, and an answer key to the exercises in Viking Language 1. Viking Language 1 Audio Lessons: Pronounce Old Norse, Runes, and Icelandic Sagas are sound files of all the Old Norse reading passages and runic inscriptions in Viking Language 1. The audio passages coordinate with the grammar and vocabulary of the lessons in Viking Language 1. They tell of Vikings, Iceland, and old Scandinavia and are an indispensable resource for learning vocabulary, comprehension, and the flow of language. Sentences in the audio are divided into phrases. The method speeds learning and allows self-correction. The listener can stop the tracks at any point to repeat words and phrases. The audio follows modern Icelandic usage and is read by Icelander Ása Bjarnadóttir with introductions and instructions by Jesse Byock. Viking Age Iceland: Combining history and anthropology, this remarkable study explores in rich detail all aspects of Viking Age life: feasting, farming, battling the elements, the power of chieftains, the church, marriage, women’s roles, and kinship. It shows us how law courts, which favoured compromise over violence, often prevented disputes and insults from becoming ‘blood feud’. Iceland thrived for 300 years until it came under the control of the King of Norway in the 1260s. This was a unique time in history, which has long perplexed historians and archaeologists, and which provides us today with fundamental insights into sometimes forgotten aspects of western society. By interweaving his own original and innovative research with masterly interpretations of the Old Icelandic Sagas, Jesse Byock brilliantly brings it to life. The Prose Edda is the most renowned of all works of Scandinavian literature and our most extensive source for Norse mythology. Written in Iceland, it tells ancient stories of the Norse creation epic and recounts gods, giants, dwarves and elves struggling for survival. It preserves the oral memory of heroes, warrior kings and queens. In clear prose interspersed with powerful verse, the Edda provides unparalleled insight into the gods’ tragic realization that the future holds one final cataclysmic battle, Ragnarok, when the world will be destroyed. These tales from the pagan era have proved to be among the most influential of all myths and legends, inspiring Wagner’s Ring Cycle and Tolkien’s The Lord of the Rings. This new translation by Jesse Byock captures the strength and subtlety of the original, while his introduction sets the tales fully in the context of Norse mythology. This edition includes detailed notes and appendices. The Saga of the Volsungs: An unforgettable tale of princely jealousy, unrequited love, greed and vengeance, the Saga of the Volsungs is one of the great books of world literature. Based on Viking Age poems, the Volsung (Völsunga) Saga combines mythology, legend and sheer human drama. At its heart are the heroic deeds of Sigurd the dragon slayer who acquires runic knowledge from one of Odin’s Valkyries.Yet it is also set in a very human world, incorporating oral memories of the fourth and fifth centuries, when Attila the Hun and other warriors fought on the northern frontiers of the Roman empire. An illuminating Introduction links the historical Huns, Burgundians and Goths with the events of this Icelandic saga, whose author claimed that Sigurd’s name was ‘known in all tongues north of the Greek Ocean, and so it must remain while the world endures’. With its ill-fated Rhinegold. the sword reforged and the magic ring of power, the saga resembles the Nibelungenlied. It has been a primary source for fantasy writers such as William Morris, and for J.R.R. Tolkien’s Lord of the Rings and for Richard Wagner’s Ring cycle. The Saga of King Hrolf Kraki: Composed in medieval Iceland, Hrolf’s Saga recalls ancient Scandinavia of the Migration Period, when the warrior chieftain King Hrolf ruled in Denmark. In the Old Norse/Viking world, King Hrolf was a symbol of courage. Sharing rich oral traditions with the Anglo-Saxon epic Beowulf, Hrolf’s Saga recounts the tragedy of strife within Denmark’s royal hall. It tells of powerful women and the exploits of Hrolf’s famous champions – including Bodvar Bjarki, the ‘bear-warrior’, who strikingly resembles Beowulf. Combining heroic legend, myth and magic, Hrolf’s Saga has wizards, sorceresses and ‘berserker’ fighters, originally members of a cult of Odin. Most startling is the central love triangle: Hrolf’s father, a man of insatiable appetites, unknowingly abducts his daughter, who later marries the despised sorcerer King Adils of Sweden. A powerful human drama with deep historical roots, extraordinary events and fierce battle scenes, Hrolf’s Saga ranks among the masterworks of the Middle Ages, influencing writers such as J.R.R. Tolkien. A sweeping epic of the Viking Age, Grettir’s Saga follows the life of the outlaw Grettir the Strong as he battles against sorcery, bad luck, and the vengefulness of his enemies. Feared by many, Grettir is a warrior and also a poet and a lover who is afraid of the dark. Unable to resolve the dispute that has outlawed him, he lives outside the bounds of family life and he roams the countryside, ridding Iceland and Norway of berserker warriors, trolls, and the walking dead. The saga presents a poignant story of medieval Icelandic society, combining details of everyday legal disputes with folklore and legend. Written in the fourteenth century, but based on earlier oral and written sources, Grettir’s Saga, with its scathing humour, explicit verses, and fantastic monsters, is among the most famous and widely read of Iceland’s sagas. This new translation features extensive maps and illustrative material. In a land of ice, great warriors search for glory… When a dragon threatens the people of the north, only one man can destroy the fearsome beast. Elsewhere, a mighty leader gathers a court of champions, including a noble warrior under a terrible curse. The Earth’s creation is described; tales of the gods and evil Frost Giants are related; and the dark days of Ragnarok foretold. L'Islande des Vikings: Seigneurs sanguinaires, maraudeurs sillonnant les rivages de l’Europe du Nord et pillant tout sur leur passage, les Vikings n’ont pas bonne réputation. Et pourtant ils ont fondé, en Islande, sur cette île demeurée quasi vierge de toute présence humaine jusqu’au ixe siècle, une société unique : basée sur un État libre et indépendant, elle est en grande partie exempte des hiérarchies sociales habituelles – y compris dans les rapports entre hommes et femmes – et fait reposer le règlement des conflits davantage sur le consensus que sur la violence et la guerre. Entre festins de raie pourrie et manuel de survie en milieu hostile, conflits juridiques et méthode de construction des maisons en mottes de terre herbeuse… c’est la vie quotidienne des Vikings à l’époque médiévale qui nous est ici dévoilée. En entrelaçant ses propres recherches historiques et archéologiques avec ses interprétations magistrales des sagas, ces récits littéraires typiquement islandais, Jesse Byock fait revivre cette civilisation avec brio. La Stirpe di Odino: I primi coloni raggiunsero l'Islanda dalla Scandinavia e dalla Britannia vichinga alla metà del IX secotò e qui diedero vita a uno stato libero, indipendente e non gerarchico, che costituisce un unicum nella storia europea. Le strutture sociali, economiche, politiche e giuridiche, infatti, per quanto ispirate a quelle delle zone d'origine, dovettero essere modellate su una realtà geografica del tutto nuova, difficile e affascinante, e durarono con minime evoluzioni fino alla conquista norvegese del 1260, dando vita a una civiltà rurale, con una stupefacente cultura del diritto e un forte senso dell'onore. In questo libro l'autore indaga l'Islanda indipendente in modo globale, facendo ricorso a molteplici tipologie di fonti, da quelle giuridiche a quelle archeologiche, e in particolare analizza le splendide saghe, capolavori letterari dai quali è possibile ricavare la più esatta descrizione di quello che voleva dire vivere nella "terra dei ghiacci" tra IX e XIII secolo. Translated by Prof. Chusaku Shibata and Tomoyuki Inoue.